Whiterun carriage driver Bjorlam: "Need a ride?" There are multiple methods of transport in Skyrim. Walking is the slowest speed at which you will normally move. To walk, use the movement control appropriate for your platform. You cannot move faster than at a walking pace while you are overencumbered. You will generally spend most of your time moving at a moderate run; running uses no stamina. You can also strafe or sidestep using the left or right "move" commands. Sprint by holding the sprint control key (or toggle on/off for the Special Edition). Sprinting is significantly faster than running. As it consumes stamina, you can only sprint for a limited distance. You will generally exhaust your stamina more quickly when sprinting in heavy armor or when wielding a heavy weapon. Walking or running backwards is slower than going forwards, and you cannot sprint backwards or sideways. Also see information on falling, which can hurt or kill you. Sneaking is another mode of movement, information on which is located here. You can travel much faster on horseback than on foot. You can also ride a horse while overencumbered for normal or fast travel. For complete information see Horses. Carriages will carry you between the nine capital cities of each hold in Skyrim for 20-50 gold. They are the fastest means to get to cities which you have not yet discovered - although in the plain game, they are only available in the five major hold capitals: the four smaller hold capitals can be the destination but not the origin of a carriage journey. The fare to the five larger hold capitals of Markarth, Riften, Solitude, Whiterun, and Windhelm costs 20 gold, whereas going to the four smaller hold capitals of Dawnstar, Falkreath, Morthal, and Winterhold costs 50 gold. 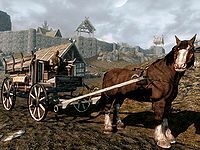 With the Hearthfire add-on, homestead carriages also provide transport from the three homesteads to Darkwater Crossing, Dragon Bridge, Ivarstead, Karthwasten, Kynesgrove, Old Hroldan Inn, Riverwood, Rorikstead, Shor's Stone, and Stonehills. There is no charge for these services beyond the initial cost of hiring the carriage driver. When first arriving at one of the five major hold capitals, you can speak with the carriage operator for some local information. Carriages will not operate when you are overencumbered. Three ferrymen are added by the Dawnguard add-on and can transport you between three coastal cities for 50 gold, or to Icewater Jetty for 500 gold. You can also take a self-service ferry between Icewater Jetty and Volkihar Keep. You can fast travel from any exterior location to any location marked on your in-game map and which you have discovered (visited). Discovered locations are indicated on your map or compass with light-colored markers. Dark-colored markers, on the other hand, are places you have had marked on your map but have not yet discovered yourself, and therefore are not available for fast travel. Although fast travel transports you "instantly", a more "realistic" amount of game time will have passed upon arrival; however, such elapsed travel times are the same whether on foot or horseback. With the Dragonborn expansion, fast travelling while riding a dragon transports you almost instantly in game time. You cannot fast travel when near any hostile enemies, when overencumbered, nor when falling, jumping or between the animation while mounting a horse. Fast travel is totally disabled when playing in Survival Mode, except while riding a dragon. This page was last modified on 20 May 2018, at 06:55.